A modern gas furnace usually has an electronic spark generator to ignite the gas when the thermostat calls for heat. An older gas furnace has a standing pilot that stays on all the time — or at least, it's supposed to. 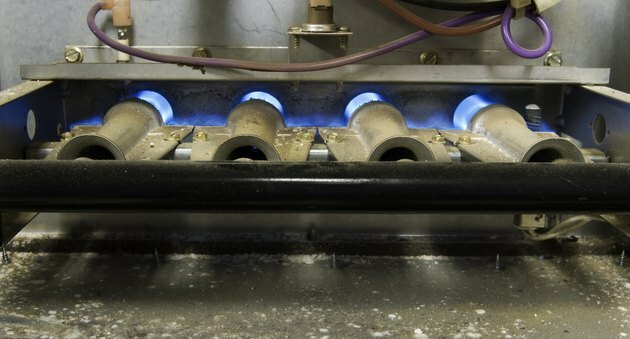 A number of things can make an old furnace pilot light go out, including a strong draft, a faulty thermocouple or a loss of gas. When the pilot goes out, you may need a service pro to determine and fix the cause, but if you're fairly sure the gas is flowing and everything is working normally, you can relight the pilot yourself. There's a standard procedure, but it's always good to double check the instructions for your furnace, which are usually posted on a label near the gas control. Whether you have a gas floor heater, a floor furnace or some other type of gas heater, the gas control is usually prominently placed on the front of the unit. You may have to lift or remove a panel to access it. If you're unsure where it is, follow the gas supply line. The gas control is a knob with an arrow on it, and the pilot tube is a thin copper tube that extends from the control box to the burner system. You'll see another tube that also begins at the gas control and terminates close to the pilot orifice. That's the thermocouple. If you see a red button next to or under the gas control knob, the furnace has a spark ignitor. If you don't see this knob, you'll need a long match or a long-barreled lighter to start the pilot. Open the gas valve on the supply line and turn the gas control knob to PILOT. Push in the knob and hold it in. If the knob won't go in, fiddle with it until it does. The controls on older furnaces tend to wear out. Push the ignite button repeatedly if the furnace has one. Otherwise, hold a match or lighter close to the pilot tube orifice. Keep pushing in the control knob for about 20 seconds after the pilot lights. This gives the thermocouple time to warm up and keep the gas valve open. Release the knob and make sure the flame stays on. If it does, turn the knob to the ON position. If it doesn't, repeat the procedure. If the pilot comes on, but it won't stay lit, the thermocouple may be bad, and that's probably the reason the pilot went out in the first place. Manual pilot lighting isn't totally a thing of the past; some modern furnaces still have push-button spark igniters. Even though the pilot compartment is sealed, you use the same procedure for relighting the pilot that you use for a furnace without a sealed compartment.